There was more proof today, that as President, Barack Obama has become irrelevant. Still wounded from the major losses in the November mid terms, the White House is trying anything to get back on course. That “anything” was former President Bill Clinton, who was more than willing to meet Obama in the Oval Office to discuss strategy on the “Bush Tax” cut compromise with the GOP. But I would sure like to know what “brilliant” White House strategist suggested that Obama and Clinton hold an unannounced presser in the Briefing Room later today? Catching Press Secretary Robert Gibbs by surprise, Obama led Clinton into the briefing room, made a few cursory remarks and then said he had to leave, not to handle an international crisis, but to attend the White House Christmas Party! “I’ve been keeping the first lady waiting for about half an hour, so I’m going to take off,” Obama said. Now that’s leadership for you. President Obama in another act of stupidity, earlier today, said he will delay his families vacation in Hawaii to make sure that the new START Treaty is passed? No, not to guarantee that all our taxes do not go up, or even to calm down the angry members of his own party. Obama pulled the same stunt last year, that time over Obamacare, which did not get passed until March of 2010. 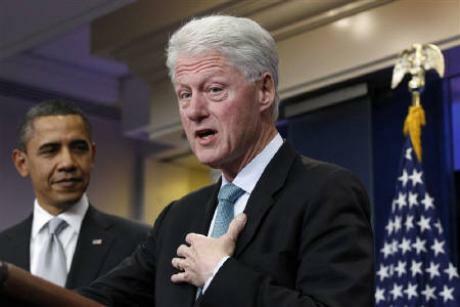 Tuning in at that moment to their favorite cable news channel, viewers must have rubbed their eyes in disbelief in seeing Bill Clinton, solo, once again holding court with the press, with out a script or even a teleprompter. That’s what all this posturing is about; the White House is in panic and Obama is afraid that his entire agenda will be derailed once the Republicans take majority control of the House and reduce his majority in the Senate. Starting in January 2011, all bets are off. Obama was forced to cut a deal now, rather than have to give up all the added spending. Harry Reid has been very busy buying votes from his disenchanted Democratic Senators. With $55 billion in incentives, Reid added an ethanol tax credit, which Sen. Tom Harkin (D-Iowa) supports, and an extension of a cash grant program for the renewable energy industry, which Sen. Sherrod Brown (D-Ohio) favors. Also included are sweeteners to Rum producers and Hollywood producers. Reid even added one of his own pet projects, the Online Gambling Bill to make it legal to use a credit cards or checking account online to gamble. But all this deal making may prove too late as reported in Bloomberg News. The U.S. government posted a wider budget deficit in November as spending swelled compared with the same time last year. The deficit was $150.4 billion last month, exceeding the median estimate of economists surveyed by Bloomberg News, compared with $120.3 billion in November 2009, according to the Treasury Department’s budget statement released in Washington. The budget shortfall will reach a record $1.5 trillion this year compared with $1.3 trillion in the 2010 fiscal year. Senator Bernie Sanders filibustered for nine hours in protest over the Tax Cut deal, while at the same time President Bill Clinton was charming the press and President Barack Obama was eating gingerbread cookies elsewhere. I bet he was happy and probably remembering those nights in the Oval Office being serviced by one Monica Lewinsky!